​Motivation and curiosity are the building blocks for learning. Why 3D Printing and Design? The Morean is bringing a unique opportunity to you for your kids -- a blending of technology and art. In the end, art is about expression, with the advent of 3D printing the process of "making" something has shifted from the "how" to the "what". And the "what" is the design part...the thinking part. We call it "Think It ... Make It". 3D printing is amazing. Kids (and adults) are mesmerized by it. However, without learning how to design, 3D printers are merely 3D copy machines. In other words, printing what other people have designed - missing the potential for creating a desire for learning. Kids are already adept at working in the 3D virtual world -- thanks to their computer games. You might not consider gaming a useful skill, but it is. The skills they have developed playing games are directly transferable to 3D design...and yes, it is called CAD, just like real engineers use. Only we teach a very simplified and free version called TinkerCAD. Back in the day, schools taught shop. Unfortunately, mainly to the boys, but that is changing now. A kid spent weeks making something that someone else designed. 3D printing changes all of that, we call it 21st Century Shop (tm). For those of you who have taken 101 and 102 previously, this will be a chance to brush up on your skills. There will a choice of projects to make. After completing the CORE, students can enroll in workshops to learn how to design specific projects. For example, one workshop will be how to design these fish fossils. It can move in all directions...and no, it is not assembled...the magic of 3D printing. These workshops will also be offered on-line (live) - so if you have a computer your young creator will be able to participate from home. 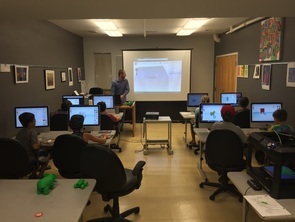 Just like with the other workshops, their 3D prints will be available for pickup the following week at the Morean Arts Center. When your student decides to designing on their own, we also offer 3D printing services. They can design it and we will print and deliver to the Morean. They can send us a link to their design and we will provide you a quote. Of course, we also sell 3D printers, starting at $250...when they decide this is something they like.